This 15 gallon 8 micron 24" x 33" Lavex Janitorial high density can liner / trash bag is perfect for a variety of applications. Use it in restrooms, offices, restaurants, hotels, amusement parks, or outdoor recreation centers! Featuring a star seal at the bottom, this Lavex Janitorial can liner helps eliminate leaks, messes, and spills to make carrying the trash from the bin to the dumpster much easier. Perfect liners for simple trash cans. Not for pointed or heavy objects, but for small kitchen or bathroom trash it works perfectly! For the price and quantity it cant be beat and will last us a long time. Great quality. Easy to use and store. Appropriate for all serving and catering needs. Highly recommended. We use it for our trash needs in the store. These are nice trash bags, They don't have a fancy smell, which i like. They are pretty strong that they don't rip and cause a leak. Great product and a great price for 1000 of them! These are good bags, and surprisingly durable for the price. They come off the roll easily, open (relatively) easily for a bag on a roll, and generally don't rip or puncture. Good value. Good medium duty bags for 15 gallon size trash. We use for office trash cans, that will be mostly paper and other light, bulky waste. I don't know if they would work as well with heavier waste. These trash bags are a necessity to have in your kitchen or any work environment. Love that they come in such a huge amount as well. These garbage bags did the job and for the best price I have yet to find. These are for small business or school garbage cans that will not throw away anything heavy. Stellar Price!!!! It does its job very well, for a very affordable price if compared to other similar products. Very resistant and strong can liner, made for heavy duty places. Perfect for small trash cans that get light weight use. We use them for cup trash and they are perfect. We have had zero tares. Great liner for light duty applications. 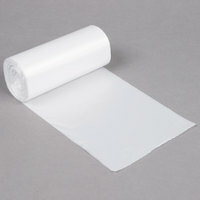 Save money by using these instead of heavy duty liners in bathrooms and register areas. Using a different liners for the register than the food prep areas also helps to distinguish the bags in case you ever have to track down a receipt or invoice that is accidentally thrown away in the dumpster. Love this trash bags. They are extremely durable and do not rip easily, they are built to withhold all sorts of thrash and fit nicely on a 15 gallon thrash can. Definitely recommended to upgrade your less dense bags to this item. These trash bags work mostly for paper products. They are not very sturdy. I recommend them for lightweight trash only. The price is so low that the end justifies the means. These are the typical small size bags that we use at a Church/school. Low price is key as they are changed daily and with not a full load. Overall they are comparable with what we used to use, but a little more stretchy. I would reorder again if the price is always competitive with other options I may find. These are great trash bags for the price however I would use them for a diaper pale or dirty rags rather than an actual everything goes trash can. good standard trash can liner. The size is perfect for our inside trash cans. They are nothing fancy but they work well and its a good value. Love this little bags they are just right for a small trash can, this bags won't hold to much weight, we use them for light trash.. like empty cups, paper, and for the bathroom waiste. Great quality trash bags. They dont rip easily, and they hold a lot of weight. We use these every day here at my job, and we wouldnt use any other type. This is honestly a really great deal for the amount you get! Great for light duty recycling or trash, not heavy duty but extremely affordable. Perfect bags for light trash and items that will not puncture the bags. The only downfall to these bags is that once you poke a tiny hole in them it doesn't take much for them to rip in half and drop all of the contents. For the price and quantity you cant beat it for lightweight trash. We needed a small trash bag for normal household size trash cans and for office trash cans. This bag is the perfect size for those uses. Great liner, durable and good quality. Works perfect for 13 gallon size trash cans. Comes in rolls in the case, easy to disperse to several locations. These bags are a little thinner that our previous bags but they seem to hold up well in our trash cans. These bags seem to not break as easy and are a better price. Webstaurant store does it again ! Found it here at the webs store where you can find the largest selection of restaurant goods from one location! And the price and quality is outstanding , not to mention the great cust service. This review is for the 15 gallon high density can liner. We purchased it for the great price and customer reviews. 5 stars! These garbage can liners are thin yet hold up well, sometimes when the garbage bag is over full I will carry the whole can out to the dumpster, I don't trust the bags that much. They are a thin clear plastic material but do hold up well and fit nicely in the garbage cans. These can liners are not bad at all. Easy tear perforation and a tough small can liner. I will continue to buy these, cant beat the price! These bags are designed for lightweight paper trash only. Anything sharp or heavy will tear through the bag. High density bags are not stretchy like low density and work well for small wastebaskets. THEY ARE SO THIN WHEN I PULLED ONE OF THE ROLL IT PUT A HOLE RIGHT THRU IT. I WOULD NOT RECOMMEND THIS PRODUCT TO ANYONE. These bags are good for very light weight items. They hold up well in my small bakery, but for soft items (egg shells, flour, etc.). I don't recommend putting any type of box in these bags, as they rip fairly easy. I use these for my restroom trash cans and they are very practical and economical. I would definitely recommend this product. Ordering is easy and shipping is fast. You get A LOT of trash bags for this price! I use these in my classroom but also at home. They arent the most durable but they are worth the money. excellent trash can liner - very strong and very large - perfect size for food service business - will purchase this item again and again - this liner has not ripped apart once to date - a great bag. Strong, durable trash can for when you need a more visible alternative. Easy to use, doesn't rip. Easy to dispense and store and transport to many office areas thanks to the convenient rolls. Had a hard time finding the right size trash bags for the cans we have in our office. These are a great fit, and give us a little extra to tie off a really full bag. It's really thin, we purchased for recycle bins but couldn't handle too much - nothing heavy or pointy. It's a good deal if you are purchasing for very light weight waste. These are very thin. Not what you would really want in any situation other than when you just want the cheapest thing possible. I think they might be ok for office trash cans, that's about it. They also don't fit our 15gal recycling bin that we also bought here, #690354173.
this is the worst trash bag i can buy, it just tear up so easily and it's pretty small. i'm not too sure if its actually fit 15 gal trash can. Very good for light weight trash but cannot handle a lot of heavy items. Not very durable but you get a lot for a great priced! Roughly 2cents per bag, our company uses these for kitchen, break room, and office/personal trash cans. We go through these bags like crazy, but at 2cents per bag, it's not hard on our budget. Some bags are expensive, making you want to dump your small trashcan into a larger one just to save the small bag. For these, as long as the trash is half full, we toss them. We no longer feel the need to penny pinch because the bags are cheap enough that you won't have to! Great product for what I use it for! I use these for shredded paper and collecting soda cans. I wouldn't recommend these for a trash receptacle in a kitchen, they are too thin and tear easily. These bags are not as durable as we were hoping. We wanted to use them as a substitute for another large bag that was out of stock. They work well as a light weight trash bag but for ollecting light weight items such as paper. These trash bags are great for smaller office size trash cans without a lot of weight! They do tear easily if too much weight is applied inside...other than that ...there is no comparison to the price and the amount that is included in each package! These are ok for very basic light usage. Get too full and they tear when trying to pull them out of the trash can. Not very durable. We've been having to double them. The 5 star reviews are a bit misleading. These work well for very very light applications, but other than paper garbage, they are likely to break. They are thin and somewhat fragile but good if you are simply looking for a can liner. Great Quality! At first I was worried at how thin they were but they are much stronger then I expected! They fit our kitchen trash can perfectly. We have not had any leaks or tears in them. We will definitely be re ordering these! These are sturdy trash bags. It is also thinner which makes for less space being taken up in land fills. It is genius that it is thin but very sturdy. So glad that I found this high density can liner. A great product overall. love these small trash container liners, they are the perfect solution for keeping your small cans clean and are very tough,have not ripped one yet. Good for throwing away soft paper items - maybe at an office desk. We use this at a cafe where people throw away liquids and sharp wooden stirring sticks, so we get holes and leaks almost every day. We have continued to use them because they are clear (a requirement to reduce product loss at the bookstore in which we are located). These bags are much too thin for use as a sturdy trash bag. I use these as bakery bags when delivering goods to customers. The presentation is personalized to the individual consumer, which is a plus and appreciated. Tie the bag with a bow, and you have a cute little surprise package. Wonderfully packaged product! The box should be easy to store with access to the liners. The bags are thinner than I expected, but they are fully functional.